Dr. Walker has added the XEO SKIN REJUVENATION SYSTEM to his office armamentarium. XEO has several modalities including the procedures listed below. The Titan Procedure is a safe, non-surgical process that uses an infrared light source to tighten skin and reverse the signs of aging. The Titan heats the dermis to cause collagen contraction while preserving the epidermis through continuous cooling. In addition, Titan can stimulate long-term collagen rebuilding that leaves patients with younger looking skin. The Titan Procedure treats lax and redundant skin throughout the body—including the abdomen, thighs and arms—and is also used to tone, lift and tighten skin on the face and neck. 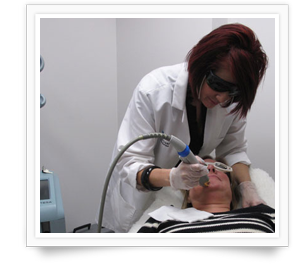 The Titan Procedure utilizes a blended, infrared light source to reverse the signs of aging. By creating significant heating in the dermis, the Titan essentially tricks the body into repairing the skin. The overall skin structure contracts due to the applied heat and subsequent collagen denaturing which continues over time. Exceptional results are achieved with the Laser Genesis non-ablative procedure by gently heating the dermis and preferentially targeting fine lines and structures such as microvasculature. The procedure is comfortable, requiring no anesthesia. It improves texture and rosacea, reduces pore size, redness, and fine lines. There is no patient down time and it is safe and effective for all skin types. If you are troubled by sun or age spots on your face, hands, chest, legs or arms the Coolglide XEO System may be for you. This innovative product is cleared by the FDA for permanent hair reduction, vascular treatments, laser skin rejuvenation, and sun and age spot removal. The CoolGlide XEO’s revolutionary pulsed light technology allows us to safely and effectively remove freckles and age spots in just a few treatments. Many patients will see dramatic results with just one treatment. A new innovative laser system has now made it possible for physicians to remove embarrassing, unsightly leg veins in the widest range of patient skin types. Treatments are fast, more comfortable and effective. The treatment is non-surgical and requires no painful injections or incisions. Treatments begin with the larger veins first, proceeding along the entire length of the vessels. The patented handpiece cools and soothes the skin as it glides along. Long term success varies from patient to patient and vessel to vessel. Many vessels treated require only one or two treatments. Dr. Walker has added the CoolGlide laser system to his existing hair removal laser to add a new dimension. The CoolGlide has now made it possible to treat all skin types including tanned patients. The CoolGlide system is fast, disabling hundreds of hair follicles in seconds. The patented handpiece cools and soothes the skin as it glides along the skin surface. Treatments are matched to the patient’s skin type, and is faster than electrolysis. CoolGlide is cleared by the FDA for Permanent Hair Reduction. Light therapy is recognized by centers of excellence throughout the world as an important mode of treatment for acne, non-melanoma skin cancers and photorejuvenation cosmetic skin care. It can be combined with chemical peels to enhance the effects of these treatments. When pretreated with ALA, precancerous and superficial cancerous lesions of the skin can be treated with this specific light therapy to clear the skin without surgery.